Our Mediterranean mix livens up this tradition style hummus. Served w/ cheesy crostinis. Hot, creamy artichoke dip topped w/ bread crumbs from our homemade dough. Served w/ cheesy crostinis. Bread sticks covered in parmesan cheese then cooked to a golden-brown w/ our garlic butter. Served w/ a side of marinara. Our famous focaccia bread covered in our garlic butter & smothered in mozzarella cheese. Melted to perfection & served w/ a side of marinara. 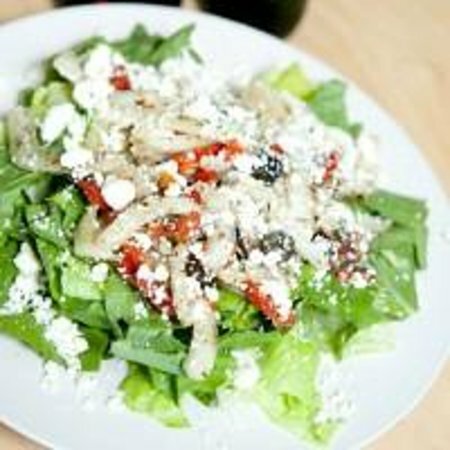 Mixed greens, topped w/ onions, green pepper, cucumber, & tomatoes, finished w/ your choice of dressing. Romain lettuce, homemade croutons, parmesan cheese, & caesar dressing. Romain lettuce, paired w/ our Mediterranean mix of onions, garlic, sundried tomatoes, black olives, & home made vinagrette, topped w/ feta cheese. 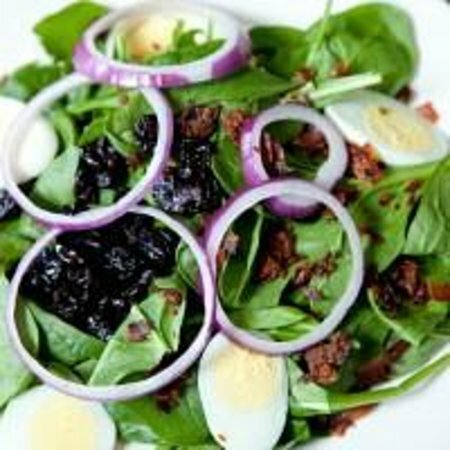 A bed of spinach, topped w/ onion, bacon, hard boiled egg, served w/ your choice of dressing. Mixed greens topped w/ fresh turkey, ham, bacon, onions, green peppers, cucumbers, tomatoes, & cheese. Finished w/ your choice of dressing. All pizzas available in 8″ personal pan sizes & calzones. 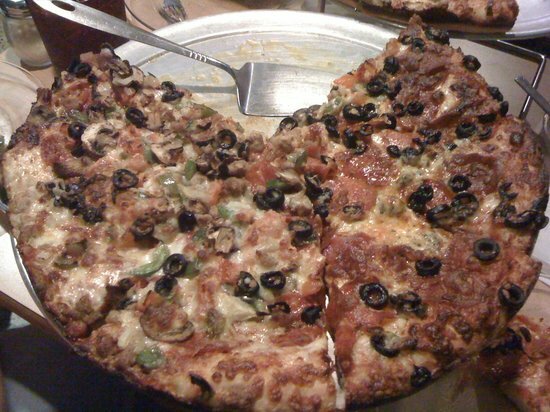 Start w/‏ sauce & cheese, add fillings to your taste. 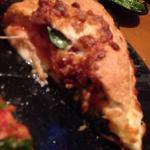 Choose any toppings or try one of our signature pizzas as a calzone! 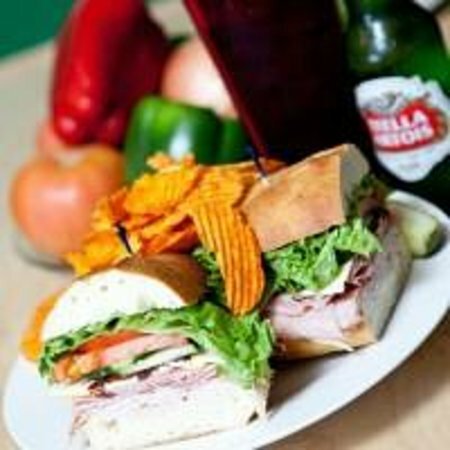 Bread options: pretzel bread, sargie roll, focaccia; all sammies served w/ regular or BBQ chips & a pickle spear. Homemade meatballs, smothered in piping hot marinara sauce. 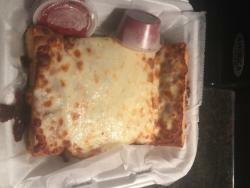 Topped w/ melted mozzarella & parmesan cheese, served on the sargie roll. Fresh spinach, paired w/ our classic mix of Mediterranean veggies, topped w/ feta cheese, on your choice of bread. Homemade chicken salad mixed w/ michigan dried cherries, diced celery, & toasted almonds in a light tangy sauce. Served on a bed of lettuce, or a choice of bread. Unique pretzel bread exploding w/ crisp bacon, red tomatoes, & the greenest romaine lettuce. Sliced turkey‏ & ham, topped w/ crispy bacon, lettuce, cucumbers, tomatoes, swiss & American cheese, & finished w/ our one of a kind garlic mayo. 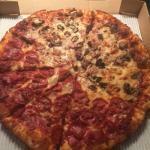 Hubby got the meat pizza and thought it was great. I got the chicken salad sandwich with a side salad. Sandwich was delicious and salad very fresh. Delivery guy was awesome as well. Will definitely go into the store in the future. If you want a slice of pizza or a calzone this is the place to eat at. 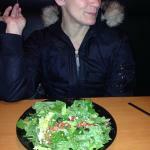 The sandwiches are great, the prices are extremely reasonable, the service is wonderful. Cold beer on tap, what more could someone want. We had a party and ordered several pizzas for delivery. Delivery was on time. Pizza seemed a little overdone to me. The service is always friendly and the food is good. We usually get a meatball Sammie and just tried the Buffalo Chicken Dip which was really good. The atmosphere is comfortable, low key and has that local independent vibe. Ordered pizza on line to pick up. Service was friendly. Pizza was very good. Dough was very good. Will return. 2nd Try another Strikeout, Not to Return !!! 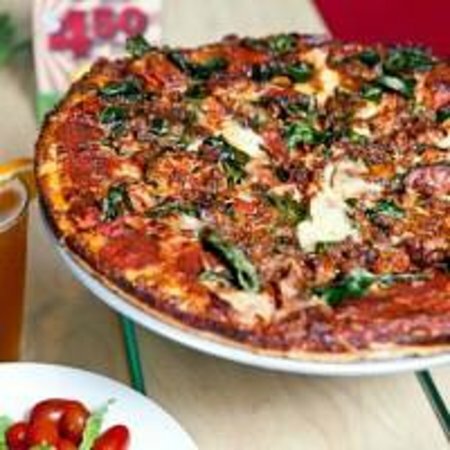 Pop eye's pizza is the best Mediterranean salad great service is excellent price is reasonable don't expect Domino's the ingredients are fresh . 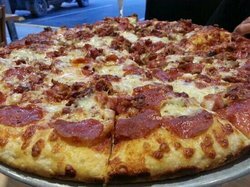 Get quick answers from Sergeant Pepperoni's Pizzeria staff and past visitors.